Team Speak is a special application for creating voice conferences. Is mainly used by lovers of online gaming, for the coherence of actions in the game. For example, their own channels in TeamSpeak create games Dota, Lineage, Warcraft and other. Download and install the Teamspeak application itself to create the channel and get the opportunity to communicate with other users. To download the program, navigate your browser to the link http://teamspeak.com/index.php?page=downloads&id=1a. Next, install the program on the computer, run the downloaded installation file and follow the installer's instructions. For communication in this application, connect access Internet, as well as microphone and audio equipment (headphones or speakers). 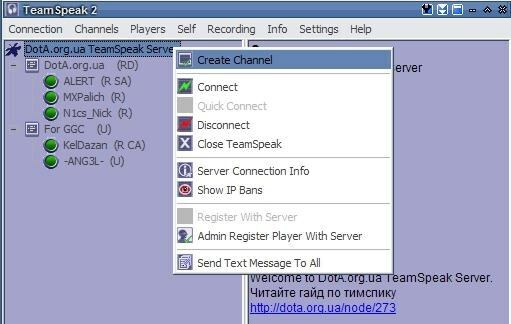 After installing the program, you can begin creating your own channel in Teamspeak. Connect to the Teamspeak server, the server address can be found on the game site. Start the app, select Connection – Connect. Then right-click the mouse on the "Server" from the context menu select "Add server". Next, specify the name of the server to which you want to connect and create your own TeamSpeak channel. In the top menu, click Self – Register with server, fill in the registration form. Next, reconnect to the server. Specify the necessary settings for the connection name, server address and your nickname is displayed. Next, click Connect. You will see a list of channels and user data channels. Each channel in Teamspeak usually created a specific team or community (clan). Users of the same channel do not hear what is happening in another channel, like a chat room. To create your channel, click the right mouse button on server name and select Create Channel. Next, complete the following fields: channel name, topic, you need to set the password for the channel codec, short description, you also need to set the number of users, the maximum allowed on the channel. Click "OK". Create your own TeamSpeak channel is completed.